Hello there again! One more press release tonight! This one is for the Sally Hansen Rio Collection which is a collection of 8 matte glitter polishes. I see a lot of cool kitchen sink manicures in my future using these babies! Let's take a look! THINK: Multi-colored matte glitter polishes to give you a passport to party. WHAT THEY ARE: New celebratory, glittering, confetti colors joining Sally Hansen’s beloved long-wear, high-shine nail polish collection. With Sally Hansen Hard As Nails Extreme Wear Nail Color, you always get outrageous shine plus the most of-the-moment colors. Now, with the new Rio collection, head to Brazil’s premier party destination anytime with eight color burst sensations. Channeling the bright colors and dazzling sequins of Carnival, throw your own personal masquerade ball with this must-have collection of multi-toned blue, green, and purple glitter palettes. Each modern, maximum shine polish look lasts up to a full week. For an exotic color getaway, try these new shades alone, layered together, or worn with your favorite solid Sally Hansen polish for a unique, tone-on-tone glitter effect. 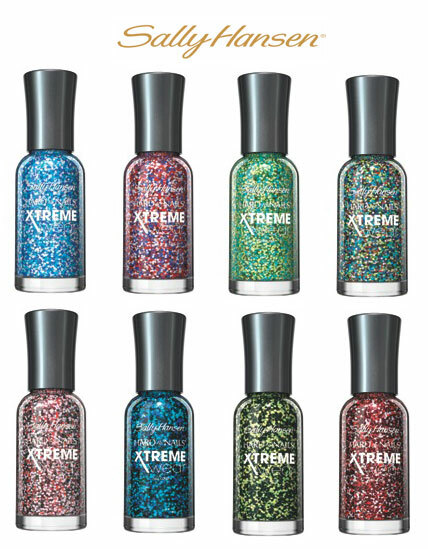 Hard As Nails Xtreme Wear Nail Color features Sally Hansen’s exclusive Micro-Shine Complex, an advanced formula that bonds shine polymers and Bioactive Glass directly to nails for extreme strength, lustrous color, and brilliant shine. The specially designed Perfect Glide Brush deposits flawlessly smooth, even color with every stroke for a perfectly bulletproof look, guaranteed. Click here to see the picture I took of them when I received them the other day! They're so fun!